If this is Arnold Schwarzenegger's comeback then his best days are behind him. After ending his political career as Governor of California, this is the Austrian's first solo vehicle in ten years: a colossal fizzer that would leave his most adamant fans impatient by the halfway mark. On its first weekend in the US, the film opened at a miserable ninth place, collecting just six million dollars and never looked like improving. How did this happen to one of the most recognised action heroes in movie history? Age isn't a factor to me. Schwarzenegger is now sixty-five, which might seem like zimmer frame territory for his work, but there are older stars like Clint Eastwood who are still raking in the dollars. 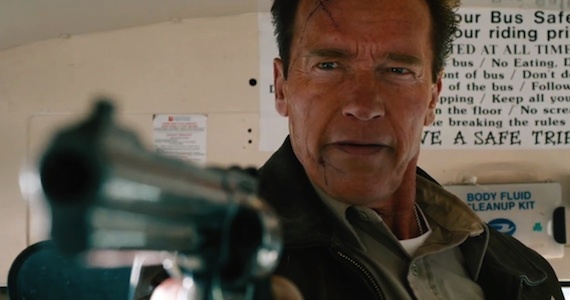 Bluntly, Schwarzenegger hasn't made a great film since the Nineties. The Terminator films still rate as the apex of the modern action genre, but the series faded after the second movie. His best films were always boosted by a mixture of humour and technology, and the ability to soften the malice of the violence through one-liners and clever self-parody. However, these are no longer his own idiosyncratic qualities to make him seem unique again. The high level of gory violence that marked his early films is now frowned upon by studios because it weakens the bankability and the likelihood of roping in younger demographics. Ideologically, Arnold also belongs in a bygone era too. He is a renowned Republican, who once admired Richard Nixon. His films are similarly ingrained in archaic, conservative values of one man, separate from government, who can save the world. But this culture of Reaganism is dead now and action films, like The Dark Knight, have becomes infinitely more sophisticated in blurring the lines between good and evil. 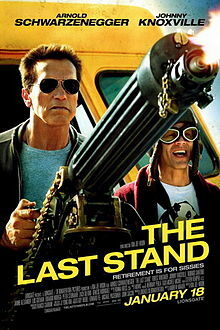 Nonetheless, The Last Stand is as conservative a film as Schwarzenegger has ever made. He plays Sheriff Ray Owens, who guards the dusty town of Sommerton in Arizona. He's surrounded by a small ground of deputies, which include: Mike (Luis Guzmán), Sarah (Jaimie Alexander) and Jerry (Zach Gilford). 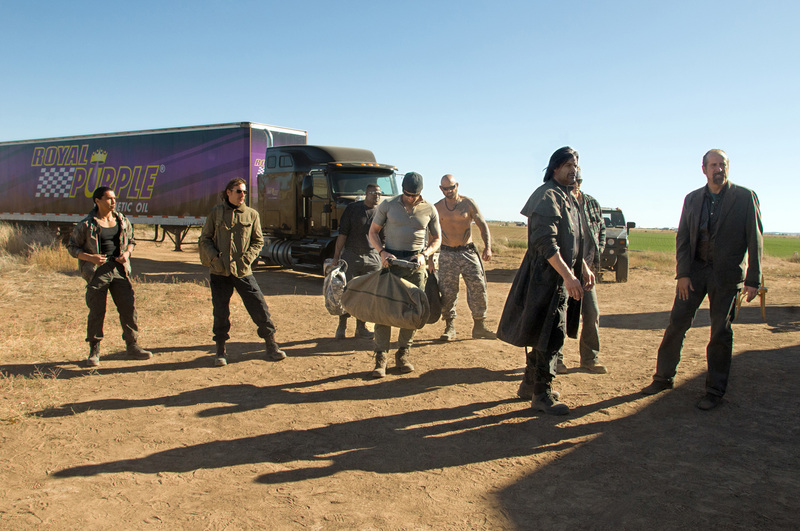 They deal with the town's small problems and eccentrics, including Lewis Dinkum (Johnny Knoxville), who is a weapons collector and local inmate Frank (Rodrigo Santoro). 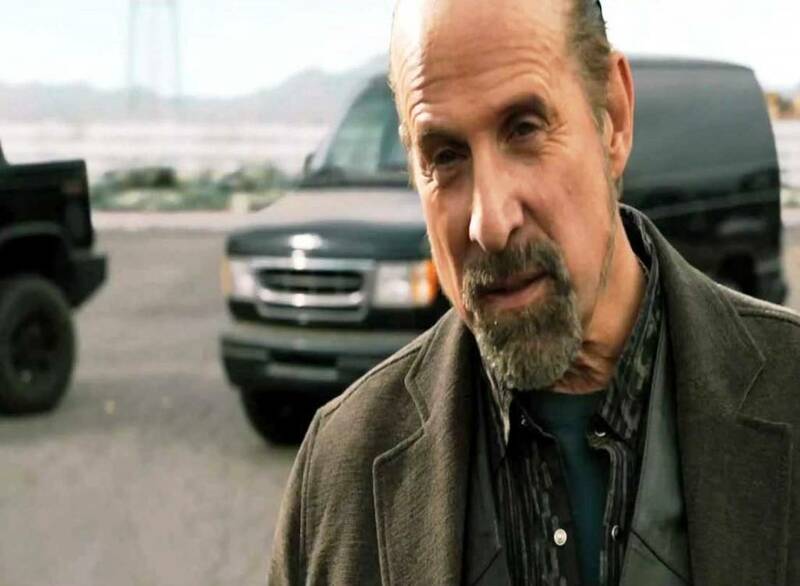 Ray is also suspicious of a pair of seedy goons that are making their way through the town, one of whom is named Burrell (Peter Stormare). Meanwhile in L.A., Gabriel Cortez (Eduardo Noriega) is a dangerous criminal who has escaped custody. Pursued by Agent John Bannister (Forest Whitaker), Cortez uses a high powered sports car to elude capture and takes a female agent hostage. He plans on crossing the Mexican border via a bridge through Sommerton. Ray and his team have to prepare for a surge by Cortez and his mini army of highly powered thugs, who are looking for a clear exit route. There are vague strands of a Western here, with Schwarzenegger playing the role of an honest lawman, who wants to protect his town against the more contemporary city folk. But for a long period the film is terribly lethargic, devoid of energy, and its narrative contains no surprises, lacking a unique story hook or concept. Korean director Jee-woon Kim's also makes the fatal flaw of relegating the film's megastar to the backseat. Too much time is spent with Cortez's sports car, a painfully indiscreet vehicle for someone evading the law, and having the side characters dominate the action scenes. Arnold only becomes involved in the second half but few of the stunts seem to test his ageing joints. His first big action scenes, firing a shotgun from a truck and unloading a Gatling gun from the back of a school bus, both have him sitting stationary. His character is also caught between two conflicting tones. In the first half there are close-ups of Arnold's weathered, stony face, examining his wrinkles and fake tan, as he fires off lines like: "I've seen enough blood and death. I know what's coming." But late in the film, Kim also tests his hand with slapstick comedy and then fetishising those high powered weapons. It doesn't gel and Kim's choppy visual style leaves the action cold too. The only distinct set pieces are the two climaxes: one in a cornfield with hidden cars and then a clumsily staged and embarrassing showdown on a bridge. This over-edited fistfight combines the worst of Lethal Weapon and World Wrestling, on top of a cringing, conservative message about keeping illegal immigrants at bay. Perhaps with all that gunfire though, Arnold's film didn't fail because it was dated. Instead, maybe his most lead-heavy films, especially this one, are a sad reminder of those real would-be cowboys today, who'd like to look down the scope of their guns and say: "I'm the sheriff."